Here some more photos of my exploration of grandma's garden! I'll bet that nice green grass was sure yummy Speedy! 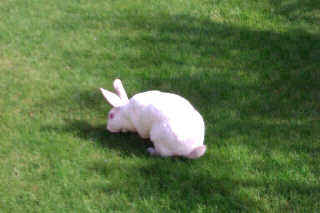 You look like a completely different Speedy Rabbit from that angle. I see none of your chocolate markings. Grandma's house/garden is always more fun. Well, the chocolate nose button is all that counts, then, since that is the perfect "bullseye" for a smooch! 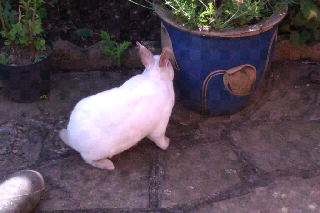 Nommy looking grass, and is yous chasing bugs behind that pot? Thank you, all your Kitties are cute too! Speedy I want to come and play with you! Speedy, I see you exploring things all the time. I bet you are a really good detective. And, I know you have special ways of traveling and take friends on special adventures sometimes. My problem is I don't really know a lot about computers and I can't contact A Houseful of Rabbits. Have you taken everyone on a special trip or can you be a Sherlock Holmes bunny and figure out why I can't find their blog. I'm a little worried, but I always do that. I'd really appreciate your help. Thanks, Speedy, I knew I could count on you! Really? Wow, thanks a lot, Speedy. I guess we are kind of pen pals. You sure live far, far away, but it is very pretty there. This is going to be our secret, right? We are going to be secret pen pals. My name is Jane and I live in Austin, Texas. You should comme see me. We have rabbits here, too. Yeah, really! Speedy, Speeedy, Speeeeedy, wake up there is some news on the Qi papers! I'm awake and heading on over there! Speedy, you fixed it. I know it was you. I can't even imagine how many secret places you had to magically travel to, but you did it! Speedy the Great did it! You better tell RG that it was you who got HOR back up so he can thank you! just a magic closet and bunny disapproval,hehehe this was fun too! You are just a perfect little bunny-brave and modest. Thanks again, Pen Pal. Oh, Secret Pen Pal and super sleuth, We've decided to call Google Giggle in honor of what you did, because you always go-he, he, he, he, he. Is that too naughty of us? What fun for a bun to be able to play and not be confined by playpen bars.